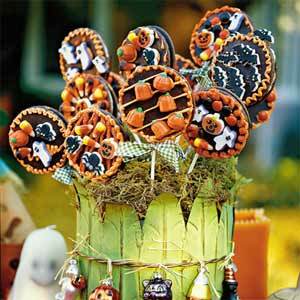 This idea was to make an arrangement out of lollipops with a Halloween theme, which can also be used for any holiday as a centerpiece or made smaller to be given out individually as a party favor. The good thing about this is, its an actual Moon Pie instead of hard candy. I personally like the party favor idea when it caters to a certain theme. Or if you use them as a centerpiece you can always give those away at the end of the party as well. People always like to leave with something....don't they ? Step 1: Insert 1 lollipop stick 2 to 3 inches into marshmallow center of MoonPie. Step 2: Microwave candy melts in a glass bowl at MEDIUM (50% power) 1 minute or until melted, stirring once; spoon into plastic bag, and seal. Step 3: Snip a small hole in 1 corner of the bag; pipe melted candy around where stick meets MoonPie to secure. Lay flat on wax paper, and let stand until firm. Step 4: Pipe fun border of melted candy around edges. Attach candies and/or cake decorations with decorator icing. Tie ribbons around tops of sticks, if desired.